Before you attempt any type of water heater repair or installation, above all, you need to take your safety into consideration. You should also ask yourself: “Am I willing to go without hot water for an extended period of time?” If you can’t assure your safety or you are unwilling to go without hot water, you may want to consider hiring a professional Frisco plumber to assess your water heater. Frisco Plumbing Pro can help provide a water heater solution. Our Frisco plumbers can go over your options and pricing to ultimately provide the best choice for your water heating system. Tankless water heaters heat water on demand without using a storage tank. Because there is no tank storing hot water, standby heat loss does not occur. Tankless water heaters are considered more energy efficient because they do not need to constantly heat water in a storage tank due to standby heat loss. Whole house tankless water heater units can supply all of the hot water needed to operate a normal Frisco home. Some considerations that must be made when selecting a tankless water heater are (1) the flow rate (GPM) needed for the household, (2) the desired temperature of the hot water supplied by the tankless water heater and (3) the initial temperature of the cold water entering the unit. Frisco Plumbing Pro’s representatives will gladly assist in tankless water heater selection process. A tankless instant water heater can be a great investment for your home. Instead of constantly heating water and storing it in a tank, a residential tankless water heater heats water on demand. Energy is only used when you need it and is conserved during all other times. Tankless water heaters are a great alternative for families that want to go green. Over time, they can significantly reduce your impact on the environment, as well as save you hundreds of dollars on your utility bill! 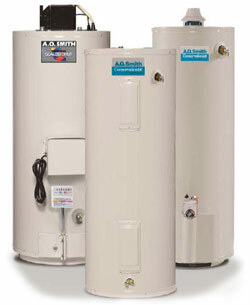 As their name implies, tank water heaters contain a tank of water that is constantly heated to the desired temperature. The hot water rises in the tank to the hot water pipe and is distributed throughout the home or business. The tank itself is commonly made of steel. Inside the tank is a dip tube where the cold water enters the tank. Some tanks contain a metal rod, made of magnesium or aluminum, called a sacrificial anode. The anode’s purpose is to draw corrosion to itself instead of the metal tank. Some models do not have a separate anode but combine the function of the anode with the hot outlet. Frisco Plumbing Pro associates provide water heater installation and maintenance services, using only the best water heaters. When you find products this good, you stick with them. Simply put, rusting is what makes steel tanks leak and require replacement. There are a number of factors which contribute to the rusting of water heaters. Aside from age, proper water heater installation, maintenance and adjustment will almost completely eliminate these factors. As a Frisco plumber, we understand that cost is major issue when seeking to repair or install a water heater. Our goal is to provide you a cost–effective solution that will produce years of worry–free and comfortable hot water. We stand by our Frisco plumbing service and hope that you will give us the opportunity to serve you. Most of our Frisco water heater calls are emergencies. Homeowners often wait until the last minute to call a professional when something goes wrong and the water heater fails. Many water heater emergencies can be avoided if homeowners follow a maintenance schedule to increase the useful life of their water heaters. Serious water damage and flooding caused by a failed water heater could therefore be avoided. Frisco Plumbing Pro can help with all your Frisco water heater repair and maintenance issues. If there’s a leak in your tank, you want to be sure your cut–off valve will work when the time comes. A lot of old valves won’t shut–off all the way due to calcium build–up. All old valves should be replaced with a ¼ turn ball valve for reliability in case of an emergency. Resistance and continuity can easily be checked with an inexpensive multi-meter or battery powered continuity tester, available at most hardware stores. Turn off the electricity, disconnect either wire from the element's terminals and test across the terminals for continuity. If there is no “beep”, or no movement of the pointer on an analog multi-meter, you can be sure that the element is defective and needs replacing. The frequency of flushing sediment from your water heater depends on the quality of your water. All manufactures recommend periodic flushing to maintain heating efficiency. In the Frisco area, we suggest that draining the tank twice each year should be sufficient. One of the most important features of your water heater is the T&P valve. To ensure that it functions properly in the event of an emergency, it should be tested each time you flush your tank. Simply lift the lever on the top of the valve and let water flow for several seconds. This simple act will help keep the valve clean of sediment and allow the seat to reseal. 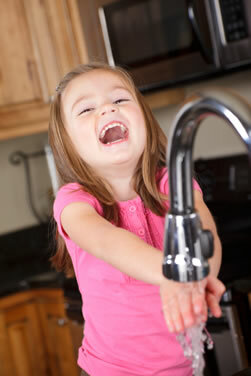 If the water flow fails to shut off completely after the test, contact your professional Frisco plumber for service. The thermostat senses when the water in the tank drops below a certain pre-set temperature and causes the burner or heating elements to come on. When the desired temperature is reached, the thermostat shuts off the burner or elements. There is a knob that allows you to set the water temperature. The thermostats for gas and electric water heaters perform different functions, however, the basics roles are the same. Gas units will only have one thermostat while electric units may have two thermostats; one for the top element and one for the bottom element. If your Frisco water heater does not seem to be heating your water properly, the thermostat may be the problem. Call us today for the plumbers in Frisco that are experts diagnosing water heater problems. See our detailed Frisco Expansion Tank information. The thermocouple is designed to protect your home from leaking gas if the pilot flame goes out. When the flame is not present, the thermocouple shut off the gas supply to the burner unit. If your water heater pilot fails to light or stay on then the thermocouple may be faulty. If you are a “handy man” homeowner then a thermocouple replacement is something you can tackle. However, if you find yourself in need of a Frisco plumber, call us ASAP. Are You Using the Right Wrench for Your Plumbing Project? First Choice for Affordable and Reliable Frisco Plumbing.